Have the Seahawks finally given Russell Wilson too little help? Russell Wilson is the archetype of a quarterback who can make something from nothing. In recent seasons, that has manifested predominantly in his ability to overcome poor pass protection. 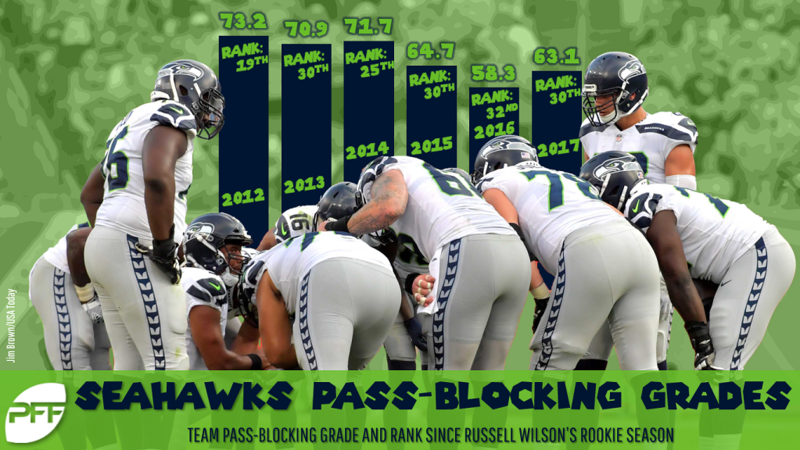 The Seahawks have been bottom-three in PFF’s pass-blocking grade each of the last three seasons and never better than 11th-worst in his six-year career. This year, the Seahawks will ask Wilson to overcome a lack of skill-position talent, and by and large, fantasy analysts believe he can do it. Seven PFF Fantasy staffers have full-season rankings on the site, and they have Wilson in a range from the second- to the sixth-best fantasy quarterback. I have a hard time pushing him further down the list, but Wilson’s lack of supporting talent could put a major dent in his volume of passing touchdowns and erase the advantage he has over the field of back-end QB1s. The Seahawks’ quartet of Doug Baldwin, Paul Richardson, Tyler Lockett, and Jimmy Graham was together three seasons following the team’s acquisition of Graham from the Saints in 2015. And while none of those receivers has been showered with individual acclaim in recent seasons, they have been productive collectively. Last year, Baldwin, Richardson, and Lockett all exceeded 10 yards per catchable target, which less than a third of receivers managed to do. Graham didn’t put up gaudy yardage totals, but he had the second-highest touchdown rate of heavily targeted receivers. There wasn’t a top-10 fantasy WR or top-five fantasy TE among them, but they did enough for Wilson to run away with the most points among all fantasy quarterbacks. “Run” is probably the operative word, because Wilson racked up 77 of his total 361 fantasy points with his legs, and his rushing ability should insulate him from some of the impact of the loss of talent around him this season. That said, I think that loss of talent is noticeable. I put together a similar table to the one above based on projections for the 2018 season. 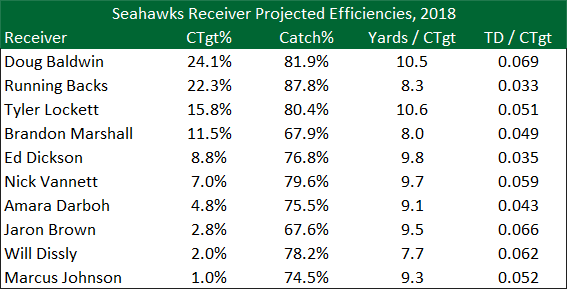 I combined the PFF full-season reception total projections — and definitely sign up for an Edge or Elite fantasy subscription to access those if you haven’t already — with my projected catch percentages to estimate each receivers’ percentage of the team’s catchable targets. The Yards/CTgt and TD/CTgt rates also come from my own ranking system. With Baldwin and Lockett each projected for bigger pieces of the team’s pie of targets and with receivers like Ed Dickson, Nick Vannett, and Jaron Brown projected to come close to the 10-yards-per-CTgt threshold, Wilson may not suffer a loss in completions or passing yards. But no new Seahawks receiver looks anything close to the red-zone threat Graham was. Based on their respective track records, Baldwin catches a higher rate of his passes for touchdowns than any of the tight ends on the team’s roster. If you allocate Wilson’s same total of 436 catchable passes from last year to his new receivers based on their projected CTgt%, he projects to throw 12.3 fewer touchdowns this season. Given that, it becomes a question of faith. Do you trust the track record of the Seahawks’ current skill players, which aligns with the conclusion of my research on the best approach to project quarterback production? Or do you trust the track record of Wilson to maybe turn Dickson, Vannett, or Amara Darboh into a viable red-zone asset? Or Brandon Marshall to somehow discover a Fountain of Youth that likely doesn’t exist? I fear that the team’s bigger bodies lack the talent and experience to find the same openings around the goal line that Graham could. If Rashaad Penny is a Marshawn Lynch kind of bruiser — he led the NCAA with 79 avoided tackles last year — then they could rely more heavily on their backs to score from close range. And if their offensive line stymies those efforts, the Seahawks may see their red-zone touchdown rate plummet. Although Wilson has thrown exactly 34 touchdowns in two of the last three seasons, a projected total of 21.7 wouldn’t be totally out of character for him. He threw just 20 and 21 touchdown passes in 2014 and 2016, respectively. He also finished respectively as the third and 14th fantasy quarterbacks those seasons — and likely would have done better but for ankle and knee injuries that limited his rushing in 2016. But ranking isn’t a perfect proxy for value. Even in 2014, Wilson’s third-place total of 333 fantasy points was just 52 points ahead of Tony Romo in 12th place. Wilson’s current market value is carried by the perception that he is a differentiator at his fantasy position. After all, he beat out the No. 2 fantasy quarterback Cam Newton, by nearly 50 points last season, and he was 93 points clear of the No. 12 QB, Jared Goff. Erase 12 of his league-leading 34 touchdown passes, and Wilson is clearly draftable. He just wouldn’t make the impact over the positional replacement value to justify his selection in the first seven rounds. I expect it will become clear whether Wilson can continue to overcome his situation within the first few weeks of this season. The trouble is, that’s too late for full-season drafters. As such, I think the prudent move is to let another drafter take him in the first five or six rounds. Opt instead for Newton in a similar range, or wait to the end and snag Dak Prescott. With similar athleticism and lack of established skill talent around him, he may be just as productive as Wilson this season.